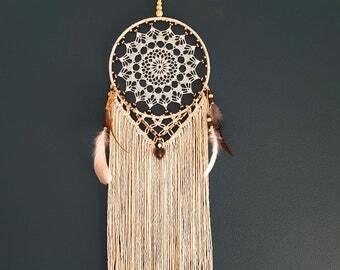 Announcement I sell handmade, unique dreamcatchers and macramé wallhangings. Beautiful decorations for your home, all made with honest materials and a lot of love! 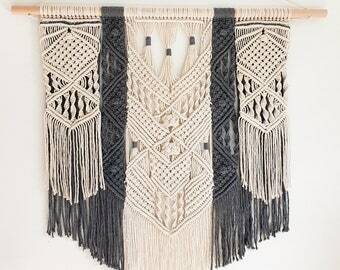 I sell handmade, unique dreamcatchers and macramé wallhangings. Beautiful decorations for your home, all made with honest materials and a lot of love! Small and large.. whatever you like! D e a r v i s i t o r ! My name is Ankie. I live in a small village in the Netherlands together with my boyfriend and I am the proud mother of two beautiful daughters and one wonderful son, who all stand on their own two feet. Also, I'm a tremendous proud grandmother of two grandchildren. My year of birth is 1960. And there you have the origin of my tradename, Type'60. Raised in the aftermath of the "hippie era" and overflowing with creativity the step towards making dreamcatchers is not that strange. It all started with a dreamcatcher made for my daughter, which I then felt it had to be completely like the old Indians made them. That dreamcatcher has evolved into the type of dreamcatcher witch I make now. With at least a nice handcrochet web, beads and naturally beautiful feathers. I have developed a special technique, with what the attachment of the web is invisible in the ring and is framed by beautiful beads. That makes my dreamcatchers even more unique, and that is what I stand for. No 13-in-a-dozen products, but stylish and one of a kind. 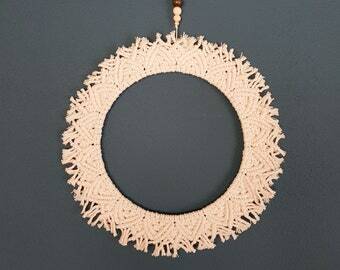 I am proud of my dreamcatchers and I plan to design and create more hip interior products. I would say ... Stay tuned! And .. Type'60 can also be found on Instagram and Facebook! What started off as a parttime hobby quickly resulted into Type’60, my very own online boutique where I share my passion, creativity and enthousiasm by creating unique, hand crafted dreamcatchers and homedecorations. How nice to meet you in my shop! Enjoy the listings and for special requests or whenever you have a question don't hesitate to email me. Type’60 hopes you are very happy with your handmade artwork. If you do receive your artwork and you think it is faulty, unsatisfactory or the wrong design, please contact me as soon as possible via email or phone. If you think your artwork has been damaged while in transit, please contact me within 48 hours of receiving the item, quoting your receipt number and contact details. You will need to return the damaged artwork to me within 14 days of receiving the artwork, along with all original packaging (this is in case PostNL needs to inspect the packaging if a claim is filed). Once I have received the damaged artwork, along with a receipt number and your contact details, I will hope to send a replacement artwork within 7 days, depending on the design and its availability. Unfortunately I cannot offer a refund for a change of mind but am happy to replace an artwork for an alternative design if I am contacted within 7 days of the order being received and the artwork is returned with all the original packaging. If the artwork is returned damaged, soiled, used, marked or scratched then it will not be accepted for replacement. If you require an alternative artwork to be sent to you due to a change of mind, all additional postage costs are the responsibility of the customer. you can pay by various methods, depending on the country from which you place the order. Artworks are sent using PostNL or DHL, The Netherlands post estimates it will take 3-5 working days to deliver within The Netherlands. For international orders, all artworks are sent using PostNL or DHL and delivery times depend on the country the artwork is being sent to. Once an artwork is in the hands of PostNL or DHL for shipping, it is unfortunately no longer the responsibility of Type’60. While I endeavour to ensure you receive your artwork on time by sending items quickly, I cannot guarantee delivery dates due to the unpredictability of PostNL and DHL. Your Type’60 purchase will be packaged in protective packaging, often reusing materials when possible. If your order arrives damaged, please contact me as soon as possible to let me know. All Type’60 Handmade dreamcatchers and jewelry are designed & created by hand. Products cannot be replicated, copied, or re-created and used without permission. Copyright for all designs, remains the possession of Type’60. 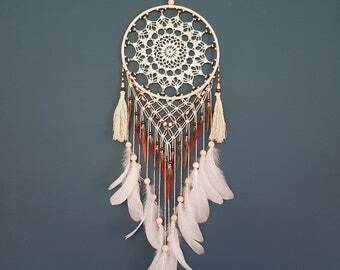 Type’60 Handmade Dreamcatchers and jewelry is a small business entirely run by me (Ankie). Every single piece is made by hand mostly using recycled and repurposed materials. Please be aware that some shapes and colors may vary due to the handmade nature of the artwork but remember this is also what makes them all so special. Be assured that I am a passionate perfectionist and I strive for consistency! So though each artwork may vary, you are receiving a high quality product that is unique and handmade. If you have any questions regarding the product please feel free to call or email. All prices displayed are in Euro’s. Type’60 reserves the right to change the prices listed at any time. Type’60 respects your privacy. Any personal details I receive from you, as a result of an enquiry or order, will be kept secure and not shared with any third party. Type’60 is committed to providing a quality product that makes you happy! I welcome your feedback and should you need to contact me please don’t hesitate to do so.